Are you a tad dramatic? Are all your friends and family always telling you that you should be on stage? Or do you fancy being backstage? Well here’s your chance! 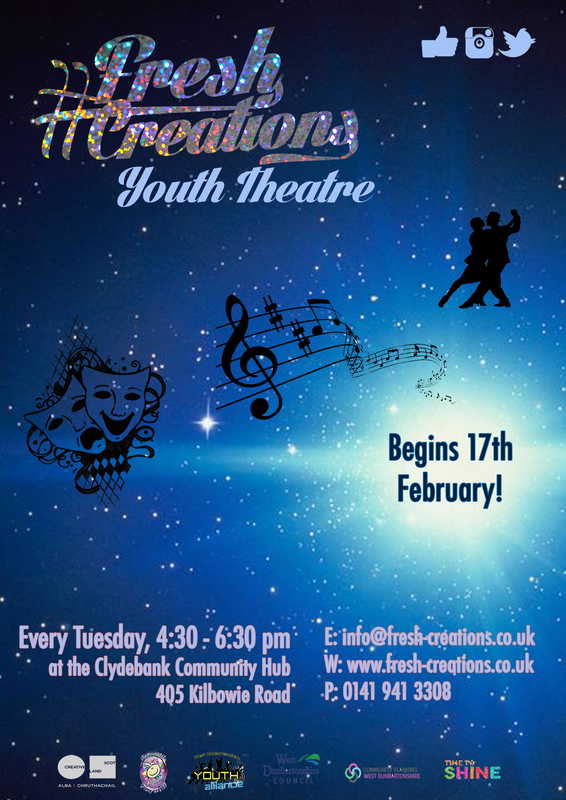 #Fresh Creations is launching a brand new youth theatre in West Dunbartonshire – #FCYT. It doesn’t matter if you’ve had no experience in the theatre or if you are one step from Broadway, we want you to join! We don’t do auditions. We don’t believe in them. Theatre is for everyone, not just the drama queens or the confident. We want this new theatre company to be a platform for young people in West Dunbartonshire to have a voice through putting on a bloomin’ good show! Summary: We aim to perform in schools, in the community and in various theatre spaces across central Scotland. The sky is the limit! You will do script work, improvisation, comedy, tragedies, devised work – the lot! What are you waiting for? All 12-25 year olds are welcome to join. There is no skill level requirement. If you require transportation, we provide a free taxi service. Please get in touch with us by phone to arrange transportation.